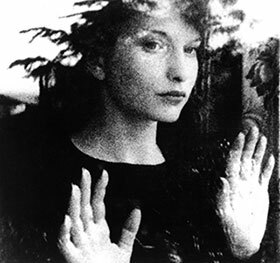 Maya Deren is one of the most influential figures in American underground film history. She has directed some of the underground's most iconic films and was a major proponet of alternative storytelling techniques through her writing. Born in 1917, Deren emigrated from the Ukraine to New York state in the U.S. in the 1920s. Then, in the 1940s, she traveled the country as the personal secretary to choreographer Katherine Dunham. These travels brought Deren to Los Angeles where she met and married cinematographer Alexander Hammid. Together, the pair made the film Meshes of the Afternoon (1943), which would gain recognition as one of the most significant avant-garde films ever made, largely due to the film's innovative "poetic" structure. Her accomplishment also inspired other local L.A. avant-garde filmmakers, like Kenneth Anger, Gregory Markopoulos and Curtis Harrington. Shortly afterward, Deren moved back to the East Coast where she continued to make films, but she also grew increasingly aggressive in promoting her work through writing, giving lectures and organizing screenings for herself. Deren's later work would focus on two of her passions: Choreography and the culture of Haiti. It was while working on a documentary on the Haitian religion of vodou that Deren tragically passed away in 1961 at the young age of 44. Her third husband, Teiji Ito, eventually finished the documentary as Divine Horsemen: The Living Gods of Haiti. To learn more about how Maya Deren has impacted the world of avant-garde filmmaking, please visit the Underground Film Timeline. Condescending article insulting Maya Deren and her film Meshes of the Afternoon, one of the indisputable classics of underground film. Using footage shot by Maya Deren and edited decades after her untimely death by her third husband, Teiji Ito, this documentary examines the practice of vodou in Haiti.